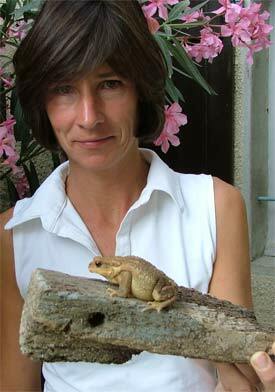 Fred the toad, not to be confused with the bar of soap! A couple of village idiots, just back from the market. 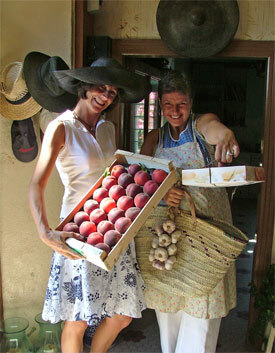 Mirjam and Caroline enjoying the local fruits of Summer. 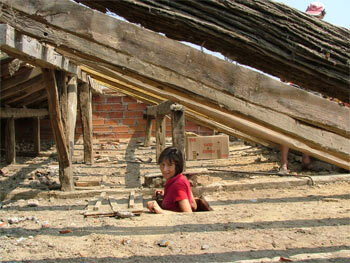 Hey, where's my roof gone?! 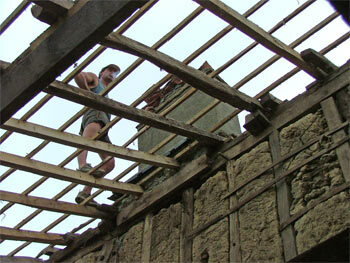 Alain walked the roof beams like it was a street. Perry got tingles in his feet just watching from below. July was a crazy month for us. Roofers, builders and visitors. there was hardly a day when we had the place to ourselves. Whoever said we'd be lonely out here! Old friends of Perry's from Amsterdam, Jan-Willem and Nicole, dropped by during their French tour. Both in the advertising business, they had a fine time chilling out in the country. Dinner was al fresco under the walnut tree. It was a real pleasure to see them again. They also turned up on the evening that England lost in the World Cup, so Perry was freed from the agony after two weeks of nail biting and hair pulling. Not having a TV, he popped down to watch at our neighbours, Peter and Janneke, who have the chambres d'hôtes down the lane. Our shower is on the ground floor, in an annex next to the kitchen. A dark, cool and moisture-filled atmosphere that attracts all sorts of beetles and amphibians during the dry, hot summer. The beetles are broomed out or flushed away, but the chap on the left is a stubborn guest. A large toad, Fred, as we now call him, is found daily in the corner of the shower, cooling off. We get him out and place him in the garden, but he always seems to be able to sneak back in. Bless him! The warm sun has an energising effect on the lizard population too. We see the tiniest newcomers zipping all over the place. They climb the outside walls and drop unexpectedly; Caroline had one narrowly miss going down her T-shirt! We have to be careful when opening and shutting the shutters, since they often sleep behind them and can get squashed. We met Karel and Mirjam after they discovered our site and told us they were about to move to France in search of a house. After a year of emailing they dropped by in March. They found a farmhouse, just 15kms up the road. In July, they arrived to sign and take possession. 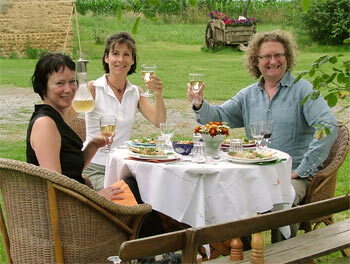 We offered camping facilities for them, their huge caravan, two dogs and a cat, at the bottom of our garden. Unfortunately, the two had decided to take a break from each other, but still go through with the sale. We wish them both luck, whichever way things turn out. 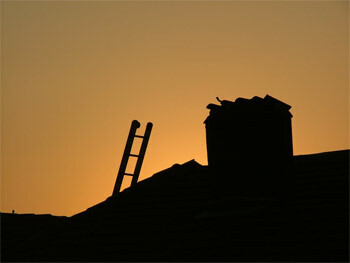 The long-awaited renovation of the roof began before sunrise, on the 16th of July. Alain and his team placed ladders on the walls and began to remove the old tiles. We didn't know exactly how many beams were still OK, or what else we might find, but they did a magnificent job and well within the three weeks he had first estimated. For a blow-by-blow account of what happened, take a look at the ROOF BLOG. (please note that the nature of a blog is that the latest entry is at the top of the page, so scroll down to the archive if you wish to read it from the start) Perry was up with the roofers at six each morning to record the event and updated the 'blog' (a diary/log on the web) several times per day. You'll learn a lot of the terminology, technique and pitfalls involved if you ever contemplate doing the same. Caroline's hard work nurturing and weeding and Perry's irrigation system reaped results. 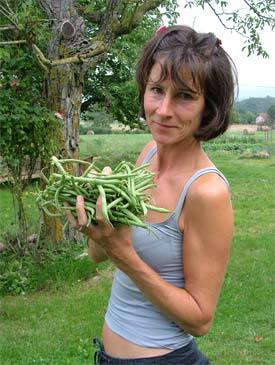 We had haricot beans by the kilos each day. We had so many we almost ate them for breakfast too! The freezers are both filled with bags of them. We made picalilli with them and gave bags full of them away and still they kept on coming. Maybe next year we'll just plant one row instead of three. The kitchen units arrived from IKEA, so we could start constructing the flat packs and finally get the hardwood work tops cut to size. They were so heavy, we had to add supports between some of the units. We used the same hardwood to create our own cupboard handles. Terry and his son Simon did a wonderful job recycling old oak beams to create fronts to the supports and buildting a frame for the cooking island. It turned out even better than we had imagined. Not that we left them to do everything. 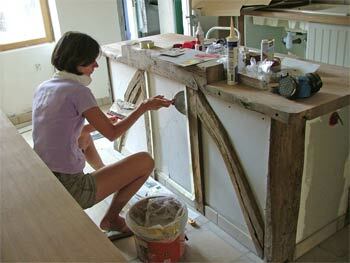 Caroline plastered and painted, Perry sanded the walls of old paint and oiled the wood. But you can read more about it in the Our House section. Next month's diary can be read here.